Power Generators in the form of a lot, but it works are based on the law of electromagnetic induction and electromagnetic force law. Therefore, the structure of the general principle is: with the appropriate composition of magnetic and conductive materials with each other and the electromagnetic induction of the magnetic circuit to produce Power Generators, to achieve the purpose of energy conversion. Alternator can be divided into single-phase generator with three-phase generator. 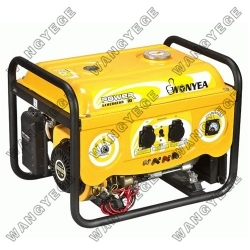 Generator is usually the stator, rotor, cap. Brush. Stand and bearings and other parts of composition. Stator consists of a base. Stator core, winding line package, and a fixed part of the other structural parts of these components. Rotor from the rotor core, rotor pole (a magnetic brief. Pole winding), slip ring, (also known as copper ring. Collecting ring), fan and shaft and other components. Through the bearing, base and cover to the generator stator and rotor assembly connected, so that the rotor can rotate in the stator, through the slip ring leads to a certain excitation current, the rotor as a rotating magnetic field, magnetic field lines cutting the stator coil movement to do , resulting in induction potential, leads through the terminal, then in the loop, it produces a current. As the brush is connected at a circuit with the rotor at the rotor according to a certain direction of rotation, resulting in alternating current circuits and other circuits so the family is alternating current, referred to as AC. China's power output current frequency is 50 Hz..